The General Directorate of Company Registration in KRG-Iraq is served under the Ministry of trade and Industry in KRG. It is the local government body entrusted to set and drive the economic agenda of the Kurdistan Regional Government of Iraq. The Directorate supports the structural transformation of KRG into a diversified, innovative service-based economy that aims to improve the business environment and accelerate productivity growth. The Directorate and its Offices develop economic plans and policies, identify and support the growth of strategic sectors, and provide services to domestic and international investors and businesses. The Directorate constantly strives to provide a responsive and trusted regulatory environment for local businesses, foreign companies’ offices and entrepreneurs in order to make KRG the best and trusted place for doing business. The Directorate is located in Erbil and centrally managed the Offices and Departments associated with company registration. The function is staffed with and supported by local Governorate Office at Erbil, Duhok, and Sulaimniyah to facilitate the services at the governorate level. The role of the Offices is to advise on, receive, review and process all applications submitted by prospective KRG registrants seeking to establish a presence in KRG in accordance with the Companies Law. The Directorate and its Offices are mandated by the Government to ensure an efficient and effective administration of entities registration of businesses and companies and to provide customer friendly services and accurate data for national planning. 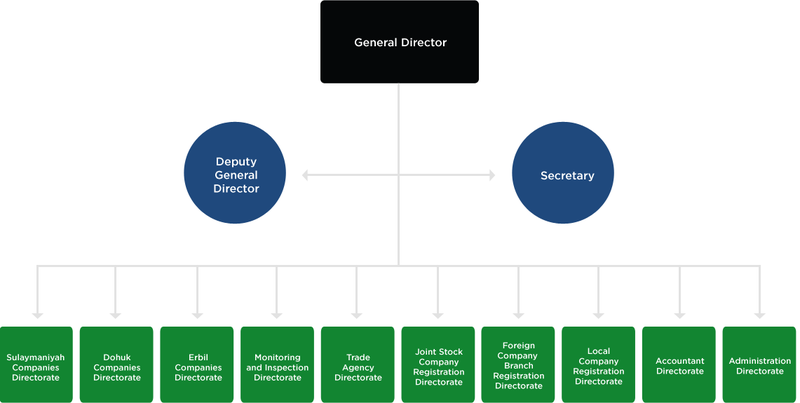 The Directorate seeks to be a highly progressive body that efficiently serves its clients; thereby becoming a strategic partner to all businesses and stakeholders. The Directorate’s mission is to ensure efficient and effective administration of entities and businesses registration and provide friendly services while applying the highest standards in doing business economically, socially and culturally, in addition to making it a highly advanced digital economy. Legal: responsible for documents validation, courts disputes and legal affairs. Administration: responsible for the administration, the store management, the in-coming and out-going documents registration.